By CAREEREALISM.com Founder, J.T. O'Donnell “For hundreds of years, the population has been seduced, scammed and brainwashed into fitting in, following instructions and exchanging a day's work for a day’s pay. That era has come to an end, and just in time.” - Seth Godin, from the book "Linchpin" ATTENTION: Calling all frustrated workers, angry unemployed job seekers, confused students and anyone else living in America who hears the Twisted Sister song, "We're Not Gonna Take It!" playing in their heads. (Special thanks to our reader, Sebastian, for pointing out I had originally and incorrectly claimed Quiet Riot as the song's singer - oops. See comments below. I love our readers!) I have something special for you! Several weeks ago, I was given the unique opportunity to interview Seth Godin. For those of you unfamiliar with his work, he's written 12 best-selling books on marketing and is the founder of Squidoo.com. 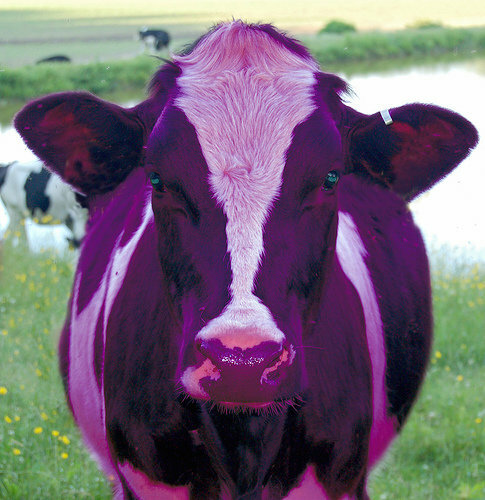 His legendary use of the term 'purple cow' in a book made the term become industry jargon. Now, he's focusing his efforts on creating the purple cow for job seekers. Seth understands why we are all businesses-of-one. He understands why "every job is temporary." In short, he is a CAREEREALISM.com soul-mate. In the video clips below, you will hear some amazingly original, thought-provoking commentary on the subject of career. Check out some of the CRAZY topics we discuss: CLIP #1 (NOTE: The audio gets choppy in one small part here, but all the other clips are excellent!) You've Been Brain-Washed & Seduced...It's Time to Fight Back! How the Internet Has Dismantled Career Planning Don't Quit Your Job - Rethink Your Approach CLIP #2 Why Career Labeling Stinks & What to Do About It Why 'Deciding' is the Hardest Part of Career Change Get Real: Impossible Goals are Just Excuses Hey Younger Generations: Congratulations & Welcome to the BEST Time to Start a Career! DON'T Get a Job, Create a Movement CLIP #3 Older Generations: Safe Doesn't Cut It Anymore The New 'Factory' is Your Computer! Stop the Frustration, Stop the Waste CLIP #4 Get Fearless, Get Reckless It was an honor to interview someone with such insight into our need to rethink career development. Seth made himself available to several other bloggers. You can find their interviews with him here. I'd encourage everyone to check them out. The more you listen to Seth, the more you'll be inspired - I guarantee it.